A functional area is a grouping of officers by technical specialty or skill, which usually require significant education, training, and experience. An officer receives his or her functional area between the fifth and sixth years of service. Individual preference, academic background, the manner of performance, training, and experience, and needs of the Army are all considered during the designation process. All branches of the U.S. military have a foreign area officer or FAO program, and the Army's is the biggest and oldest. They're grouped by areas of concentration, expertise and language skills. These commissioned officers are regionally-focused experts in military-political operations, which includes cultural knowledge, sociological insights, and geographic and economic awareness. To qualify for an MOS in the Foreign Area Officers field, you'll need to be proficient in the language spoken in the region you plan to serve. You're likely to serve in a role where you assist and advise commanding officers on decision-making, such as a defense attache, a liaison officer or a general political adviser. These officers work as part of the Army healthcare team, conducting research for national defense in chemical, biological, radiological and nuclear matters. They provide guidance for hazmat and emergency response teams and work on radiation safety and nuclear elimination missions. To qualify for this job you need a master's degree in one of the following areas: radiobiology, radiochemistry, nuclear physics, health physics, radiological physics, applied atomic physics, nuclear engineering, laser/microwave physics or a similar, related field. You have to serve for a year in a clinical laboratory facility for the Department of Defense or another eligible facility. Army entomologists are involved in all aspects of pest control measures, including disease prevention and health effects. You'll need a master's degree in entomology or biological science, and have to be a U.S. citizen to serve in this job. Like their civilian counterparts, these soldiers are medical professionals who help their fellow troops preserve and protect their hearing. They conduct hearing tests and evaluate protective devices such as hearing aids. Before you can enlist in this MOS, you need a doctoral degree in audiology, and either a one-year externship or completion of the Army Audiology Externship Program. This job is only open to U.S.citizens. These soldiers supervise scientific research for environmental health, with the aim of preventing illness among military personnel. To serve in this MOS you'll need a bachelor's degree with at least 30 hours in either biological or physical sciences, and an unrestricted license to practice. You also need to be a U.S. citizen. Social workers in the Army provide many of the same services as their civilian counterparts. They counsel to soldiers in a variety of settings, oversee and assist with patient care, and conduct research and training on issues of importance to the Army. 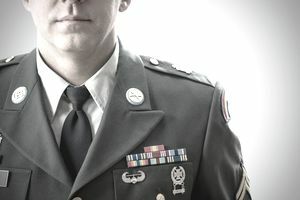 To qualify for this job in the Army, you'll need a master's degree in social work and an unrestricted license to practice if you're on active duty. You'll need the same in the Army Reserves but will also need to be a permanent U.S. resident (active duty social workers need only to be U.S. citizens). To qualify as an Army psychologist, if you're on active duty, you'll need a doctorate in clinical psychology, counseling psychology or similar sub-specialty and a license to practice. For the Army Reserves, you'll need a doctorate in clinical psychology or counseling psychology, and will have to complete a one-year internship with an American Psychological Association-approved program. Like their civilian counterparts, Army psychologists evaluate and treat patients, and conduct research on psychological conditions. These officers lead the Army's explosives experts, both technical and tactical. They conduct missions in support of Army units all over the world, coordinating the use of ordnance, advising commanders of explosive ordnance disposal threats, and commanding and controlling combat operations. If you're interested in this MOS, you'll need a top secret security clearance from the Department of Defense. You also may want to consider acquisition careers.